The Chinese government has given Zambia a grant of thirty million dollars for electrifying the Lusaka East Multi-facility Economic Zone. State House press aide Amos Chanda says the Chinese President Xi Jinping said his government will also fund the modernisation of Mulungushi International centre in readiness for the African Union heads of state summit in 2022. Mr. Chanda confirmed the development to ZNBC News in Beijing, China. And President Lungu says government is vigorously seeking investments that will promote value-addition and job creation. 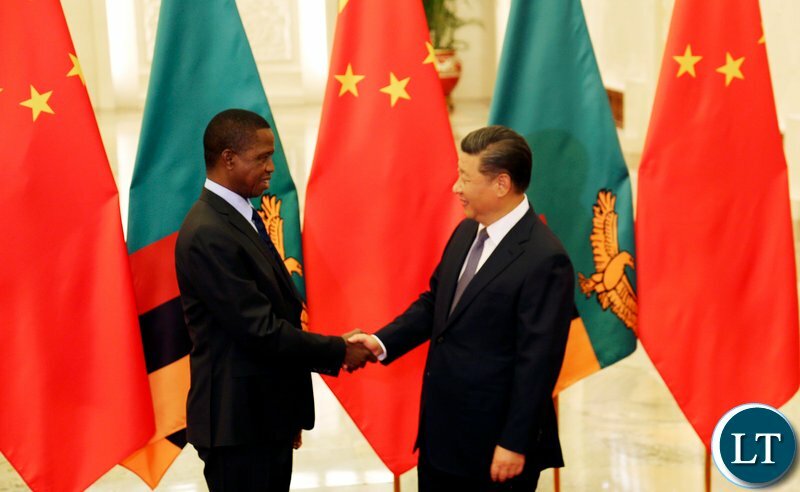 Speaking when he held meetings with fifteen leaders of multi-national companies in Beijing -China, President Lungu said Zambia wants companies that will add value to mining and agriculture products before exporting them. And the President said government has a workable development agenda that will improve the lives of Zambians. The Head of State also expressed happiness over some Chinese companies plans to help government decongest Lusaka roads by coming up with local trains. President Lungu met business executives of the Chinese construction sector, mining, telecommunications and manufacturers of electric gadgets. Speaking during the meeting one of the investors Zhang Guanjie from China North Industries Corporation said most Chinese firms want to invest in Zambia. Mr. Zhang said Zambia has a good business environment. President Lungu is in China for the Forum on China Africa Cooperation-FOCAC. Meanwhile, Zambia’s honey is set to penetrate the world’s biggest economy as it will soon hit Chinese supermarket shelves. This development comes after President Lungu and his Chinese counterpart Xi facilitated the signing of three memoranda of understanding. The MoUs are on economic and technical cooperation, belt and road initiative and the protocol for the export of Zambian honey to China. Hello economists out there! What is a grant? Lol Shameless. The man has in fact already spent 5 Million on the charter flights and accommodations for the huge delegation, Then he has to spend another 5 for allowances for himself and the whole travel party. Then he has 20 million for the Chinese contractors and they will be short then he has to go and borrow from Greenland next. The country is in trouble. – Only if a that nsosonso is contractor works on that project. Absolutely no shame at all…how can you accept money for Lusaka East Multi-facility Economic Zone? This is supposed to be a self sustaining facility …there you are begging for $30 million yet you poured the same figure in a pointless national airline. I mean which is more important on the priority list a business zone or a national airline for a country that is already serviced by several major carriers. When we tell you we have a lazy ignorant head of state with no vision nor pride this is what we mean…the man is an absolute perpetual beggar…his govt has no put up any negwee to decongest the city everything is just loans from India and China. More money in Lungu’s pocket! You might as well just say you are giving the money to Lungu coz that money will go straight to finish off the roofing of a mansion in Swaziland. Expect more fires on prime land, and more Chinese owned land. The drunkard has sold us out. @nostradamus thank u but I’m not clear with your explanation. Loan you don’t pay back? Are you saying it’s a loan you don’t pay back? could this be the same as a bribe? Its a grant, but alas, in exchange for 100,000 hectares of land. My foot! Some Zambians have no shame at all just look at Lazy in the picture…another one is Great Galu he knows that he is banned from footballing activities there he goes to greet national team players on the training pitch and risk FAZ getting fined..in 2013 he was happy to be dishing out bans left, right and centre to anyone who spoke out like late Keagan Mumba who was banned from footballing activities for 3 months by his FAZ disciplinary committee for attacking Renard’s recent 2014 CHAN qualifiers and 2013 Cosafa Cup pointless nationwide trials. The Galu himself has failed to keep himself away for 4 weeks. Kazembe – I fear for the next govt that will take over…these people are literally auctioning our national assets. This is easy money for Lazy and his empty tins since when has the Lusaka East Multi-facility Economic Zone needed funding…in fact the Chinese have their factories in there. This is extremely suspicious. Why is China now doing everything for us? Seems we can’t even do anything for ourselves anymore. We all know that China doesn’t just dish out money to poor countries for free. So what is China getting in return? That’s the side we will never be told by Lungu and his crooked PF buddies. Its now very clear that Lungu s BEGGARNOMICS is slowly auctioning Zambia to the Chinese. Lungu should stop this nonsense. If you guys have failed, Please get out. You can’t have a country run by such stupidity. You mean we will always depend on handouts? It’s the same as a home dependent on neighbors. These are Dull useless leaders with no strategy to develop our country. That’s why they go to meetings empty handed they can’t even take Notes. Meno meno will be sorted out by the Chinese mafias alone. This f00l is as shameless as they come. Edgar stop it! Stay there please Quindi mumpoto !! Koswe wamupamba uyu Chagwa! Azagwa eka! All to benefit the Chinese! They outwit Lungu. Did you see the pictures? – Not a single Zambian delegate had a paper or pen. They were memorising the discussions. Commander and begger and chief Lol. He is very proud of that title…this is a man who has never worked for a major corporation or run a successful business. “China comes with a lot of money and says you can borrow this money. But you must think, ‘How do I repay?’ Some countries see only the project and not the payment part of it. That’s how they lose chunks of their country. We don’t want that.” – Dr Mahathi Mohamad, Malaysian Prime Minister. You know what? Siri Lanka is a victim of that, they failed to pay a loan, China has taken over their port for the next 90 years to recover the loan. Shameless Beggars – examples in Zambia are all over the place like the overpriced KKIA and $1.3 billion Ndola – Lusaka road …when the loans are due for these projects and Zambia defaults China will control all the strategic assets and have us by the balls…but a dull man like Lazy Lungu who has never run anything in his life thinks he is on a win-win deal even restructuring debt for more debt. Chinese grant or a soft loan either way ,it means Lungu went there with a begging bowl …again.Let’s borrow Chinese ideas ,values and work ethic but not money. We have already borrowed Chinese “values”!!! FACTS – China have business/investments in Europe…you wont hear them cutting corners and in their country corruption carries long jail sentences …its only in Africa where they cut corners because we let them!! You are so brainless, wait what comes. A crying shame, this is no longer Zambia but Chinazambia. Finished we are colonized by China now. Shouldn’t Zambians have a say in how much debt the government puts us in ? Why are we always enslaving ourselves.Our leaders have no shame. Read new Constitution, it is between Government and PF Parliament. Do your research properly imwe. China is not the world’s biggest economy. USA is. China is second. Mukonda kunama ai? kapata – you are spot on…people do not think like that because all these little things add up here and there ..ambulances costs here, overpriced RDA contracts, National airline cost there…that’s the cost of corruption money being siphoned everywhere. Chilufya Tayali was right, Akainde has managed to brainwash his followers to an extent of seeing evil in anything whether good or bad. Google what a grant is twapapata Ba shonongo imwe. We are saying could that 42/42 million not have electrified that site ? I detest lazy people especially with lazy mindsets like rats!! Yes, we have to celebrate! But the only problem with Chinese money is that they come with their own money and their own contractors. For US grants, there is more participation by the local people. Look at the Millennium Challenge Account! What Millennium Challenge Account are talking about? That was a kind of marching order grant, our govt put 45% and the US 55%, the top project engineers are from the US, or US based companies operating in Europe. Zambia is destroyed because the wise think Silence is Golden! It’s not because PF is bad or evil but because they are too Proud to admit they don’t know that what they are doing is not good for the country in the immediate and long term from Economics point of view! When China gives you money, it’s not because they love Zambians! I am sure our president expressed the same request to Xi Ji Mping that if possible, China should help with paying off of our Euro bonds, but what has been given is money that promotes Chinese interests like power for their manufacturing plants in the Multi Facility Economic Zone! What we should know is whoever buys Zambia’s debt will rule over us! How I miss the leaders of yesteryear who valued knowledge. All these bitter comments from bitter people all the time, nothing good to say. It’s true, God sets a table for his anointed in the presence of his enemies. So they can eat their Blessings in full whilst their enemies watch with envy, jealousy and hatred. What is there to say about a shameless perpetual beggar?? We know that in Zambia, stolen or Ill-gotten things have the label of blessing and are erroneously equaled with success! We are already used to being called a thieving Christian Nation! It seems we have many young people in Zambia today who don’t understand right and wrong! Us the elderly choose to keep quiet because we know the young people think we are old fashioned. We’ll only open our mouths when the young ones have run their full course, lest they say we belong to the opposition! God cannot give us a drunkard, an adulterer, a thief as a president. Lungu is certainly not a blessing to this country, he is a CURSE. Most of these bloggers are as bitter as their kachema god,even failing to differentiate a grant from a loan.awe sure! There is no such thing as free lunch…how many so called Chinese investors are in that Lusaka East Facility, you think the govt can regulate those Chink State companies when your govt is getting free cash? Think Think…use your brains for once you dumb foooools!! We are perpetual beggars and it hurts so much. A grant is a donation without any condition. Lets be happy if good news comes to Zambia. IDC has a plan to eletrify the economical zones in the next year, therefore their resources will be used to capitalize some local companies under their care. If IDC has already plans to electrify then they have budgeted for it…do you think PF use this money for that? Do not be gullible…these people are not renowned for prudence; this is a windfall to them easy money that will disappear in proxy companies via ZESCO. Wake up from your folly!!! Everybody is arguing about the $30 million being a loan or grant…..
Because we cant do anything on our own. Shameless. It is only a fool who smiles with happiness when a competitor dangles an apple. Bushe Grant ni nkongole nangu bupe?? You only need to listen to the song “Namusonda” by PK Chishala! You may think it’s a grant but your leaders don’t read small print before signing! Sadly, small print is in Chinese! In the grand scheme of things what is ka 30 million ? From that $30 million expect the Chinese to reap $300 to $500 million from you future and your children’s future….. This is very embarrassing …..$30 million grant or what ever you want to call it….this is an insult and shows how lowerly the Chinese see corrupt lungu and his begging bowel…..this is like asking some to buy you a beer and he gives you left overs in an almost empty beer bottle…. Imwe bantu. Sometimes we should be thankful and move on. Its a grant!!! meaning we won’t pay back. Therefore the money we should have used to electrify LSMFEZ. Shall go to other economic ventures. I would have been worried if we borrowed the money, because its not necessary. As the companies set there would have done the electrification through ZESCO. Otherwise, Kudos to his excellence. My worry is on China’s plans to renovate Mulungushi International Conference. For the Africa’s intel. They did he same in Ethiopia. May be we should be concerned with bugs. So, China has given Zambia yet another grant of $30 million for electrifying the Lusaka East Multi-Facility Economic Zone! We are even told that some Chinese companies plan to help government decongest Lusaka roads by coming up with local trains. Well, from where I stand, this looks like consolidation of State capture. Africa Confidential says Zambia risks losing its sovereignty to China as that country will seize national assets once government defaults on loans.And Africa Confidential has revealed that Britain’s Department for International Development is investigating three ministries for fraud. Meanwhile, Africa Confidential has noted that government continues to spend lavishly despite Zambia being in debt distress. In a report titled ‘Bonds, bills and ever bigger debts’ published on September 3, Africa Confidential observed that ZNBC was already being run by the Chinese and disclosed that Zesco was also already in talks about a takeover by a Chinese company. Zambians work up. If you are not careful all that money will be spent on Chinese people here after giving them short and long term contracts. Even before granting lung Chinese president knows what it will all go back to China again. Fellow countrymen and women, we need to act now and stop these Chinese before they take over this wonderful Country. Mr President Sir, please keep away from these Chinese. They will mess us up. Why are we selling this beautiful country so cheaply? Can’t we make our own money and build our own economy? Which European country is forever asking for foreign investors in order to grow their economy?? This only happens in Africa where we have shortsighted leaderships! May God bless Zambia and its people! !